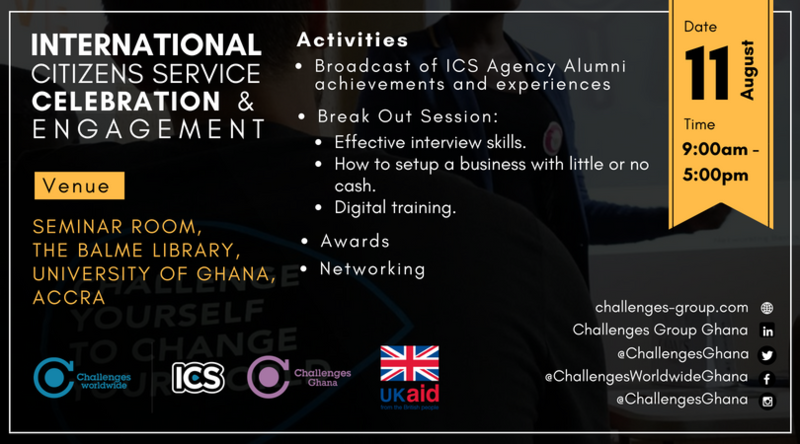 The International Citizens Service (ICS) Celebration & Engagement (ICE) event is a joint effort between Challenges Worldwide, as the coordinating agency, Balloon Ventures, International Service, Lattitude Global Volunteering and Voluntary Service Overseas in Ghana. Having supported over 30,000 young volunteers on the ICS programme and given the significant number of successful ICS innovation projects, we have gained an opportunity to celebrate our successes, showcase our impact on youth development across the world and share knowledge. You will have the opportunity to attend the event at either Accra or Tamale. Please note that you are to attend only one of these events, and attend the event CLOSEST to you. Please note that this event is open to all. We encourage that you get involved in this event as you stand to benefit from the skill sharing and opportunities that accompanies it.